Cyclone Daman has swept past Fiji's second-largest island, Vanua Levu, veering away from populated areas where forecasters had warned of major damage. But the category four storm lashed the small northerly island of Cikobia with winds of up to 250km/h (155mph). Many of Cikobia's houses were destroyed but the island's 65 residents survived by hiding in caves, officials said. "We've got to be thankful that it missed the two larger islands of Fiji," said forecaster Alipate Waqaicelua. Fiji's Disaster Management Office said it had lost contact with Cikobia after the storm struck it at about 0300 Fijian time Saturday (1500 Friday GMT). But officials later said that all the islanders were safe. "Some 65 people evacuated to caves and houses were flattened... but we have no reports of any deaths or injuries," forecaster Daini Donu was quoted as saying by the Associated Press news agency. Most of Cikobia's vegetation was destroyed by the storm, officials said. A government ship with emergency supplies, including food and medicine, is expected to leave for the island shortly. However, the full extent of the damage is unlikely to be known until an aerial survey of the island is completed. 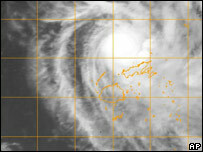 Officials said the storm was now heading out towards open water between Fiji and Tonga. "While the cyclone is weakening slowly, it's still packing a very strong punch," Waqaicelua said. Warnings of flash-floods in low-lying areas and high-tide flooding remained in place early on Saturday morning local time. Earlier, the Disaster Management Office had warned people living in low-lying areas in the Lau, Lomaiviti and Vanua Levu island groups to move to shelters or higher ground as the storm surged in from the north-west. Serious damage from flash floods, wind gusts and up to 25cm (10 inches) of rain had been expected. Cyclone Daman had been upgraded to a category four storm on Friday, and forecasters had feared it would sweep away the flimsy houses that many of Fiji's islanders live in. Although the majority of Fiji's tourist resorts are located on and around the country's largest island, Viti Levu, south of the storm's path, some tourists were reported to have been evacuated from the Yasawa Islands chain. The Australian government warned citizens visiting Fiji to find out where cyclone shelters were and contact families at home. "In some areas, adequate shelter from a severe cyclone may not be available to all who may choose to stay. You should review and follow hotel or cruise ship evacuation plans," it said in a travel advisory.